Patients who are on hemodialysis commonly experience muscle wasting and weakness, which have a negative effect on physical functioning and quality of life. The objective of this study was to determine whether anabolic steroid administration and resistance exercise training induce anabolic effects among patients who receive maintenance hemodialysis. A randomized 2 × 2 factorial trial of anabolic steroid administration and resistance exercise training was conducted in 79 patients who were receiving maintenance hemodialysis at University of California, San Francisco–affiliated dialysis units. 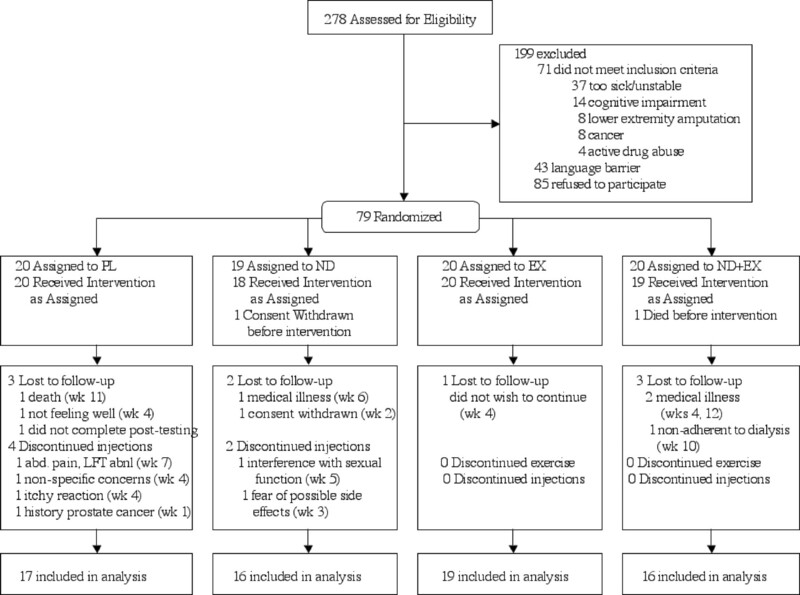 Interventions included double-blinded weekly nandrolone decanoate (100 mg for women; 200 mg for men) or placebo injections and lower extremity resistance exercise training for 12 wk during hemodialysis sessions three times per week using ankle weights. Primary outcomes included change in lean body mass (LBM) measured by dual-energy x-ray absorptiometry, quadriceps muscle cross-sectional area measured by magnetic resonance imaging, and knee extensor muscle strength. Secondary outcomes included changes in physical performance, self-reported physical functioning, and physical activity. Sixty-eight patients completed the study. 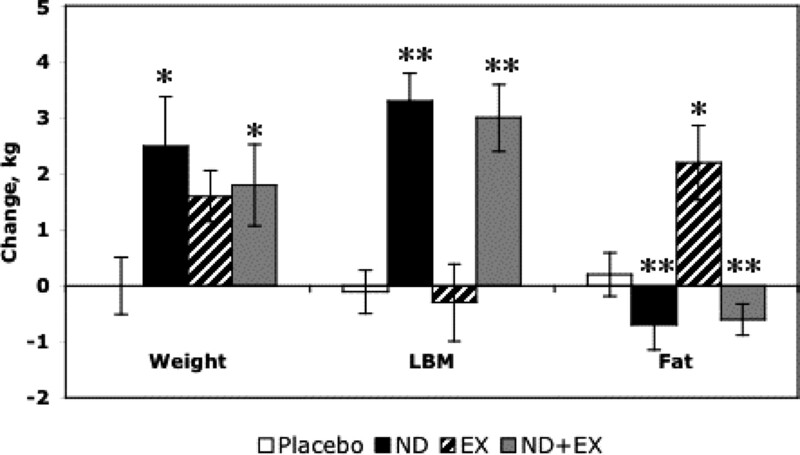 Patients who received nandrolone decanoate increased their LBM by 3.1 ± 2.2 kg (P < 0.0001). Exercise did not result in a significant increase in LBM. Quadriceps muscle cross-sectional area increased in patients who were assigned to exercise (P = 0.01) and to nandrolone (P < 0.0001) in an additive manner. Patients who exercised increased their strength in a training-specific fashion, and exercise was associated with an improvement in self-reported physical functioning (P = 0.04 compared with nonexercising groups). Nandrolone decanoate and resistance exercise produced anabolic effects among patients who were on hemodialysis. Further studies are needed to determine whether these interventions improve survival. Dialysis patients have limited physical functioning as measured by self-reported functioning (1,2), peak oxygen consumption (3–8), physical performance tests (9), and tests of muscle strength (10,11). One study highlighted the severity of debility, reporting that more than one third of hemodialysis patients were unable to perform the normal activities of daily living without assistance (12). In addition, physical functioning has been shown to be a major determinant of patients’ assessment of their global quality of life (13). Therefore, interventions to improve functioning in this population have the potential to improve quality of life significantly. Muscle wasting and weakness are particularly attractive targets for intervention because they are related to loss of function and can be measured and targeted objectively for improvement. Small studies support the possible benefits of two strategies to increase muscle size and strength among patients who are on dialysis. Anabolic steroids, which frequently were used to ameliorate the anemia associated with ESRD before the introduction of recombinant erythropoietin, were noted to cause an increase in serum creatinine along with increases in hemoglobin and hematocrit (14). Although some agents were associated with significant adverse effects, nandrolone decanoate had few adverse effects as a result of its intramuscular route of administration and favorable erythropoietic to androgenic ratio (15). More recently, nandrolone decanoate has been shown to increase lean body mass (LBM) and improve physical performance (16), and resistance exercise training has been shown to increase strength and improve physical performance (17). Neither of these preliminary results has been confirmed, and the relative benefits of these strategies or their potential additive or synergistic effects have not been examined. Therefore, we designed a study to compare changes in LBM, muscle size and strength, physical performance, and self-reported functioning during a 12-wk period among hemodialysis patients who were randomly assigned to one of four groups: (1) Nandrolone decanoate, a synthetic testosterone derivative, by weekly intramuscular injection (ND); (2) weekly placebo injections (PL); (3) lower extremity resistance exercise training during dialysis sessions three times per week plus weekly placebo injections (EX); and (4) resistance exercise plus nandrolone injections weekly (EX+ND). Men and women who were undergoing maintenance hemodialysis three times per week at the outpatient dialysis units that are affiliated with the University of California, San Francisco, were eligible to participate in the study. Inclusion criteria were adequate dialysis delivery with Kt/V ≥1.2 and good compliance with dialysis treatment (i.e., not missing more than two dialysis treatments in the month before enrollment). Patients were excluded when they had been on dialysis for <3 mo; had reasons to be in a catabolic state (including HIV with opportunistic infection in the past 3 mo, malignancy, or infection that required intravenous antibiotics within 2 mo before enrollment); were unable to give informed consent; were active intravenous drug users; had a thigh dialysis graft; or had contraindications to resistance exercise training such as myocardial infarction within 6 mo, active angina, uncompensated congestive heart failure, or orthopedic or musculoskeletal limitations. Informed consent was obtained from all participants, and the study was approved by the Institutional Review Boards. Nandrolone decanoate and a placebo that was identical in appearance to the active drug were prepared and supplied to the research pharmacy by Organon, Inc. (Roseland, NJ). Participants were randomly assigned to treatment groups in a 1:1:1:1 manner by the research pharmacist using variable block sizes, which were not known to investigators until the completion of the study. Investigators received a package with 12 vials of study drug or placebo and a card with exercise group assignment from the pharmacy after each participant was assigned. Nandrolone decanoate or placebo was administered weekly by intramuscular injection by dialysis unit nursing staff, who were blinded to treatment assignment. Men received 1 ml of study drug (200 mg of nandrolone decanoate or placebo), and women received 0.5 ml (100 mg of nandrolone or placebo). Resistance exercise training of the lower extremities was performed under the supervision of study personnel during hemodialysis sessions three times per week. Starting weights for knee extension and hip abduction and flexion were determined from a three-repetition maximum (3RM) using ankle weights that can be adjusted in 1-lb increments. A 3RM is the maximum weight that can be lifted three times with proper technique. Training started at approximately 60% of 3RM for two sets of 10 repetitions and was increased to three sets as tolerated. When patients could perform three sets with correct technique, the weight was increased. In addition to knee extension and hip flexion and abduction, ankle dorsiflexion and plantar flexion were performed during each exercise session. Body composition was assessed immediately after dialysis, except when dialysis finished after 8 p.m., in which case measures were performed the following morning while fasting (n = 3). Dual-energy x-ray absorptiometry (DEXA) was used to measure LBM and fat mass in kilograms using a whole-body scan as described previously (16). Quadriceps muscle size was measured using magnetic resonance imaging on a nondialysis day. Proton T1-weighted axial images of the thigh were acquired at 1.5T (Siemens, Magnetom Vision Systems) with the grid for the transverse slices centered at the midpoint between the kneecap and the femoral head. The image parameters were as follows: Echo time of 14 ms, field of view equal to 210 mm2, matrix equal to 256 × 256, slice thickness of 8 mm, 15 slices. The single slice with largest quadriceps area was selected for analysis. A customized software program written in IDL (Research Systems, Inc., Boulder, CO) allowed for the separate quantification of contractile and noncontractile components of the muscle area as described previously (11). Each image was analyzed three times, and the average quadriceps muscle cross-sectional area was recorded. Muscle strength during knee extension was tested using a computerized dynamometer (Cybex Inc., Ronkonkoma, NY). Patients were positioned in the chair, and the knee joint was aligned with the axis of rotation of the dynamometer. Patients performed five maximal leg extension repetitions at 90 degrees/s and 15 repetitions at 120 degrees/s. 3RM testing was performed during a dialysis session for knee extension, hip abduction, and hip flexion. Measurements were made on a day after dialysis. Patients were timed while walking 20 ft at their usual pace and as fast as possible. Patients also were timed while walking up one flight of stairs and while rising from a chair five times. Physical activity was measured using three-dimensional accelerometers (TriTrac R3D; Professional Products, Inc., Madison, WI) that were worn for 1 wk as described previously (18). Self-reported functioning was measured using the Physical Functioning (PF) score of the SF-36 (19) and the Human Activity Profile (HAP) (20). The PF scale asks individuals to characterize their degree of limitation in performing 10 activities as not limited at all, limited a little, or limited a lot. The HAP consists of a list of 94 activities, and patients are asked to report whether they still do the activity, no longer do the activity, or never did the activity. The Profile of Mood States was administered to assess whether treatment assignment was associated with changes in anger or fatigue (21). On the basis of a two-sided test at α = 0.05, we estimated that 17 patients per group would be required to have 80% power to detect a difference of 1.1 kg in change in LBM measured by DEXA between study groups. We therefore planned to enroll 20 patients per group, anticipating a 15% dropout rate during the course of the study. Baseline characteristics of the groups were compared using ANOVA or Kruskal-Wallis tests where appropriate. For the analysis of outcomes, all available data were analyzed according to the original treatment assignment. Changes in weight, LBM, and other outcome measures across groups before and after treatment were compared using two-way repeated measures ANOVA with time, exercise, and nandrolone as predictor variables and with the baseline value of the outcome variable as a covariate. The possibility that changes in the primary outcome variables in response to nandrolone or exercise were different between men and women was examined using t test. Results were considered to be statistically significant when two-tailed P values were <0.05. Statistical analyses were performed using STATISTICA (Statsoft, Tulsa, OK). A total of 278 patients were screened (Figure 1). Eighty hemodialysis patients were enrolled in the study, and 79 were randomly assigned. Characteristics of the study population are shown in Table 1. Overall, the cohort was composed of 49 men and 30 women; 46 (58%) were black, 19 (24%) were Asian or Pacific Islander, and 14 (18%) were white (including 10 of Hispanic ethnicity). The average age of study participants was 56 ± 13 yr with a range of 26 to 88. There were no significant differences in baseline patient characteristics across study groups (Table 1). Disposition of patients in the nandrolone and exercise trial. Groups are as follows: Placebo, weekly placebo injections; ND, weekly nandrolone decanoate injections; EX, lower extremity resistance exercise training during dialysis sessions plus weekly placebo injections; ND+EX, weekly nandrolone decanoate injections plus lower extremity resistance exercise training during hemodialysis sessions. Sixty-eight patients completed the study. Reasons for noncompletion are shown in Figure 1. Six participants discontinued study drug (four who were receiving placebo and two who were receiving nandrolone) before the end of the treatment period, only two of whom discontinued all study participation. Therefore, results for the four patients who discontinued study drug but were still available for follow-up measures are included in analyses. Those who received placebo discontinued because of an itchy reaction at the injection site, a nonspecific feeling that the drug was having adverse effects, abdominal pain and liver function test abnormalities, and discovery of a history of prostate cancer. Those who received nandrolone discontinued because of interference with sexual function (after five doses) and fear of possible adverse effects (after three doses). Ninety-one percent of patients who were assigned to receive nandrolone decanoate received 100% of assigned injections; two patients missed one injection each, and one patient discontinued injections after receiving five doses. Patients who were assigned to resistance exercise training completed 89 ± 8% of scheduled sessions (range 69 to 100%). Exercise progressed from an average starting weight of 9.2 ± 4.2 lb for knee extension to 13.9 ± 5.1 lb at the end of the training period. Patients started at 5.6 ± 3.0 lb for hip abduction and progressed to 9.6 ± 4.0 lb; for hip flexion, patients started at 5.3 ± 3.2 lb and increased to 9.5 ± 4.3 lb by the end of the study (P < 0.0001 for all changes from week 1 to week 12). Changes in body composition are shown in Figure 2 and Table 2. There were significant changes in body weight over time (F = 20.64, P < 0.0001), with patients who received nandrolone decanoate gaining weight (P = 0.04), whereas there was no significant weight gain as a result of exercise (P = 0.51). Nandrolone was associated with more remarkable differences in body composition than in weight, with an average increase of 3.1 ± 2.2 kg of LBM (P < 0.001) and decrease of 0.6 ± 1.5 kg of fat mass (P < 0.001). Exercise did not result in a significant increase in LBM but was associated with a significant increase in body fat mass (2.2 ± 2.9 kg for the exercise-only group; P = 0.05). Exclusion of the three patients whose DEXA scans did not occur immediately after dialysis did not alter the results. Changes in body composition. Changes in body composition from baseline to 12 wk as measured by dual-energy x-ray absorptiometry (DEXA) are shown. □, placebo group; ▪, nandrolone (ND) group; ▒, exercise (EX) group; □, nandrolone plus exercise (ND+EX) group. Error bars show SEM. *P < 0.05; **P < 0.001. Quadriceps muscle cross-sectional area increased significantly in patients who were assigned to exercise (P = 0.02) and to nandrolone (P < 0.001) but decreased in those who were assigned to receive placebo injections only (Table 2, Figure 3). 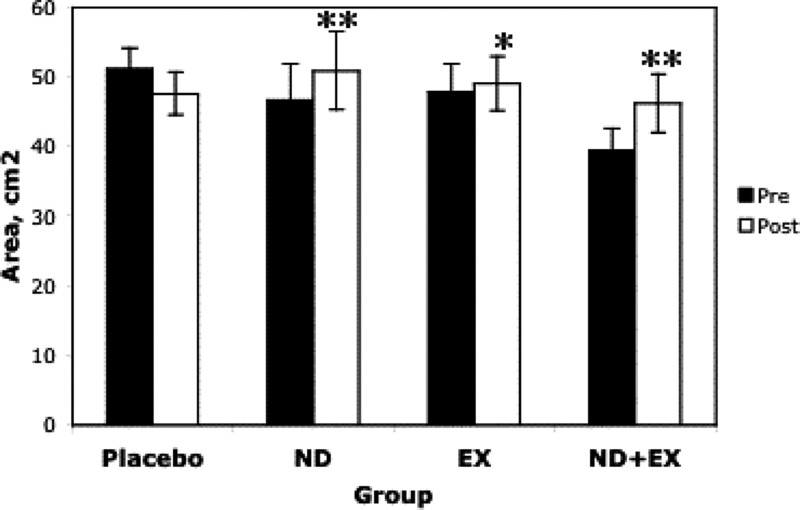 The increases in muscle area related to exercise and to nandrolone were additive in the EX+ND group as evidenced by the nonsignificant interaction between nandrolone and exercise (P = 0.43). Predialysis serum creatinine concentration also increased in the groups that were assigned to receive nandrolone but not to the exercise alone or placebo groups, consistent with an increase in whole-body muscle mass (Table 2). Changes in quadriceps muscle size. ▪, baseline quadriceps contractile muscle cross-sectional area, measured using magnetic resonance imaging; □, postintervention quadriceps muscle cross-sectional area. Error bars show SEM. *P < 0.05; **P < 0.001. Groups are as follows: Placebo, weekly placebo injections; ND, weekly nandrolone decanoate injections; EX, lower extremity resistance exercise training during dialysis sessions plus weekly placebo injections; ND+EX, weekly nandrolone decanoate injections plus lower extremity resistance exercise training during hemodialysis sessions. Changes in muscle strength are shown in Table 2. 3RM increased significantly for knee extension and hip flexion and abduction in patients who were assigned to resistance exercise training but not in those who were not assigned to exercise. Although peak torque during isokinetic knee extension at both 90 and 120 degrees/s increased in the nandrolone and exercise groups, none of these changes reached statistical significance, and there were wide variations among patients. There were no differences between men and women in the effects of nandrolone (Table 3) or exercise (data not shown) on body composition, muscle size, or strength. Neither exercise nor nandrolone was associated with improvement in gait speed, stair climbing, or rising from a chair (Table 3). Similarly, there were no significant changes in physical activity level as measured by accelerometry or as reported on the HAP. However, exercise was associated with an improvement in self-reported physical functioning on the PF scale of the SF-36 (P = 0.03). In addition, there was a trend toward a reduction in fatigue in the groups that were assigned to exercise (P = 0.06). Finally, there was an increase in anger in the group that received nandrolone decanoate alone but not in the group that received nandrolone and performed resistance exercise training (P = 0.003 for the interaction between nandrolone and exercise). This study is the largest randomized, controlled trial of exercise or anabolic steroid interventions conducted among dialysis patients. In it, we have shown that weekly nandrolone decanoate treatment and lower extremity resistance exercise training during dialysis for 12 wk were safe and well tolerated. Our results show that both nandrolone decanoate injections and resistance exercise training during hemodialysis have anabolic effects. Not surprisingly, the anabolic effects of exercise training were limited to the muscle groups that were trained, whereas nandrolone had a systemic effect, as evidenced by an increase in LBM and serum creatinine concentration. However, resistance exercise training resulted in increased lower extremity strength and some improvement in quality of life, whereas no such improvement was evident as a result of nandrolone treatment. We previously reported that 6 mo of treatment with nandrolone decanoate increased LBM and improved walking and stair climbing (16). Whereas the body composition changes in this study were similar to those of the earlier study, patients in the nandrolone decanoate arms of our study did not demonstrate the same improvements in physical performance. One possible reason for this discrepancy is the shorter duration of this study. This study was designed to administer the same cumulative dose of nandrolone during a shorter study period. However, it is possible that time is an important factor as well as cumulative androgen dose. Indeed, in the previous study, significant improvements in physical performance were not observed after 3 mo, and there was continued improvement in physical performance between 3 and 6 mo of nandrolone administration. Similarly, the lack of improvement in physical performance in the resistance exercise training groups conflicts with the results of Headley et al. (17), who reported an increase in maximal walking speed and a reduction in the time to perform 10 repetitions of the sit-to-stand test after 12 wk of resistance exercise training. It is possible that the training protocol that we used was less intense than that of Headley et al. Although they did not report the weights lifted, the training took place in a fitness center 2 d/wk using machine weights. It also is possible that Headley’s nonrandomized study included patients who were more motivated or more likely to improve functioning with training. Other potential reasons for the lack of observed effects on physical performance include a true lack of effect as well as a high degree of variability of these tests such that changes as a result of intercurrent illness or other changes in status outweigh any benefit of short-term resistance exercise training or nandrolone decanoate administration. A change in self-reported physical functioning such as we observed without changes in physical performance is not inconsistent because these tests measure different constructs. The more commonly used tests of physical performance, such as those used in our study, are limited in distance or duration and do not mimic performance of activities of daily living. Furthermore, physical performance tests, particularly of gait speed, are subject to ceiling effects. Therefore, it is possible for individuals to have less difficulty performing varied tasks without demonstrating that they perform specific tasks faster. Furthermore, improved self-reported physical functioning itself is an important outcome because physical functioning is an important determinant of quality of life (13). Increased LBM after nandrolone treatment and improved self-reported functioning after resistance exercise training may be clinically relevant in this population because both higher LBM and higher self-reported functioning have been associated with improved survival. Specifically, higher limb lean mass was associated with improved survival in a Japanese dialysis cohort (22), and Pollock et al. (23) reported that higher muscle mass as measured by total body nitrogen was a positive prognostic marker among prevalent dialysis patients in Australia. Higher self-reported physical functioning has been associated with lower hospitalization rate and mortality in several studies (2,18,24). Therefore, it is possible that increasing LBM or improving self-reported functioning could result in decreased mortality, although this remains to be demonstrated. A major goal of our study was to test a quantitative exercise intervention that could be administered in the hemodialysis unit to a broad cross-section of the dialysis population. Despite their generally positive results, studies of the effects of aerobic exercise training in the hemodialysis population have not resulted in the widespread adoption of such programs. This may reflect nephrologists’ lack of confidence in their results, perhaps because sample sizes have been small and many were uncontrolled. Alternatively, the vigorous nature of those exercise programs and the highly selected patient populations that they enrolled may have created concerns about the generalizability of the benefits of exercise in this population (3). Finally, the practicality of extensive implementation of exercise programs has not been established. Our study addresses each of these issues. Unlike most previous research, it is a randomized trial with adequate sample size to assess independently the effects of exercise and nandrolone in a cohort of hemodialysis patients that is fairly similar to the general hemodialysis population in age and self-reported functioning. Our study cohort was only slightly healthier than the United States hemodialysis population with an average age of 55.6 yr, compared with 59.1 nationally (25) and an average SF-36 Physical Component Summary (PCS) score of 35.9, compared with larger studies of unselected dialysis patients, which report average PCS scores from 31.6 to 35.2 (1,2,24). Furthermore, the interventions that we tested could be implemented in the dialysis unit without the need for expensive or specialized equipment. Because this is the first randomized study of resistance exercise training during dialysis and the first study of which we are aware to combine exercise training and anabolic steroid administration in the hemodialysis population, our results must be considered preliminary. Although our sample size is large compared with previous studies in this field, we nonetheless may not have had adequate power or intervention duration to detect changes in physical performance related to nandrolone or resistance exercise training. However, our observations that quality of life, muscle mass, and strength all can be improved in 12 wk suggest the need for studies of longer term interventions, preferably done at multiple centers and with a multiarm design similar to this project. Other limitations of this study include the unique racial and ethnic diversity found in our Northern California dialysis units, which resulted in enrollment of relatively few non-Hispanic white patients. Although it seems unlikely that the effects of exercise or nandrolone differ by race or ethnicity, this possibility could not be tested, and caution should be used in generalizing the results to non-Hispanic white individuals. Second, one of our primary outcome measures, LBM, is influenced by hydration status, and changes in hydration during the course of the study could affect these findings. However, the randomized nature of the study and the consistent timing of DEXA after dialysis or early the next morning (n = 3) should minimize the contribution of changes in hydration to the results. Nevertheless, such changes would be expected to bias the results toward the null and could explain why changes in leg muscle area that are seen with exercise were not accompanied by changes in whole-body LBM. The increase in serum creatinine concentration that was seen in the nandrolone groups also supports the accrual of true lean tissue in response to this intervention. Finally, although it is likely that increases in fat mass that were seen in the exercising groups were related to increased energy intake, we did not measure dietary intake in this study. We therefore were unable to relate body composition changes directly to changes in dietary intake. Nandrolone decanoate and resistance exercise training seem to be safe options for treatment of the muscle wasting and weakness that commonly are seen among hemodialysis patients. Both of these interventions increased muscle size. Nandrolone had a systemic effect of increasing LBM, whereas resistance exercise training resulted in a training-specific increase in muscle strength as well as an improvement in self-reported physical functioning. Further studies are needed to determine whether these interventions improve survival. This study was supported by a grant from the National Institute of Diabetes and Digestive and Kidney Diseases (DK-56182). Study drug and matching placebo were kindly provided by Organon, Inc., Roseland, NJ. See the related editorial, “Muscle Wasting in Kidney Disease: Let's Get Physical,” on pages 2097-2098. Randomised factorial mixed method pilot study of aerobic and resistance exercise in haemodialysis patients: DIALY-SIZE! Electroacupuncture Therapy for Muscle Atrophy in CKD: Is There a Needle in the Haystack? Frequent Hemodialysis: A Way to Improve Physical Function? Endogenous Testosterone and Mortality in Male Hemodialysis Patients: Is It the Result of Aging?